Instead of releasing 9th edition and feeling the need to change everything from top to bottom, how about an 8th 2.0 book that just incorporates all of the rules changes over the last 2 years from FAQs/errata/Chapter Approved/White Dwarf. They're spread out over codexes and supplements and beta changes to codexes and supplements. It would have minimal impact on the mess. The digital versions should have had this done already. I doubt GW will have ordered the changes to be applied though. Can anyone confirm this? I stopped buying ePubs off them a while ago, when they had refused to update them. I don't think they will do a 9th edition, just adjust 8th's rules. Although a printed book could be produced that update the Core rule with the small changes + all non-faction specific FAQs, Chapter Approved changes and Matched play changes. You could even take out a lot of the lore to include the few point changes pages that are in each Chapter Approved. In fact, CA2019 could be a hardcover REPLACEMENT for the BRB that included all the Core rules, and changes typically included in CA. A LOT of rule changes and clarifications are in the Core Rules. The codex errata are many, but you only need the ones for the armies you play, so they don't have a lot of impact per game. See my signature for an updated Battle Primer. This is what I think. There won't be a need for a whole new edition. It's been billed as a living system so it'll just be updates and clarifications. At some point they may do 8.5 as it were but I don't think we'll ever see a new edition like we used to. That's what I'm hoping to see. I really do like the core rules engine. I also like the updates they've made. That's why I'd like to see it all in one book. GW won't ever do this because they think proper digital copies will eat into their profit from selling 30p of paper for £40. Yeah, they seem to have very outdated views on selling things. There are essentially a few viable lists in 8th edition. You can count what they are on one hand. There is some slight variance in them but it's the same end result: if you don't field something in the top tier, you'll get smashed by someone who does. Allies have proven to make balancing the game incredibly difficult. While I don't think anyone wants to see allies completely go away, there should be more of a tradeoff so list building isn't walking the buffet line for your macro faction. More restrictive force organization charts would also help. They need to completely rework the points for everything if they're going to keep this AP system. Since finding out that CA 2018 includes all the matched play rules updates and points adjustments from CA 2017 I think that 8th edition is less of a mess*. Sure, the errata and FAQs should all be searchable online rather than in separate PDFs**, but at the end of the day they're mainly just clarifications of the rules rather than new rules. I would much rather pay £20 for the latest CA each year than have to replace the BRB and my Codex at a cost of £65 because they bring out a new edition. Points adjustments, new matched play rules and beta rules that interact with keywords are a good mechanism for a living ruleset and they don't invalidate the BRB and codexes. If you only need 3 books to play with the latest rules I'm cool with that. Trying out additional beta rules throughout the year is fun too. * GW really need to do a better job of explaining that you only need the BRB, the latest CA and your codex though. ** Similarly beta rules should all be on a single web page, even if they are published in CA, on Warhammer Community and in WD originally. Umm pretty much what 9th will be. Well some changes as well but gw will always sell things to ensure people change their armies. I think you def need the FAQ too right? This post was started because I wanted to find the changes to CPs from detatchements. Was it in FAQ 1...or FAQ 2? Or this year's CA? Or last years? Or errata? The experience of looking for it kinda bummed me out. I think that might be a fix to soup if it was applied all over. The main issue with soup is there is no drawback to just taking a detachment to offset your weaknesses and CP batteries. Making it so your Loyal 32 only provides half CP and don't get any of the special IG benefits means it's more of a choice if you want to take them. Even when you don't care about the CP (e.g. a Vanguard or Spearhead which would still provide 1 CP) it becomes more of a choice if those units won't get any of their special abilities. That change to non-primary detachments might be just the fix that soup needs. Force you to declare a primary faction keyword (with the current restriction of no Imperium, Chaos, Aeldari or Tyranid) and any detachment which doesn't have that keyword is limited, provides half CP and doesn't get their army traits. Maybe even go so far as to force the primary faction keyword to be one of the variable keywords e.g. <CHAPTER> as opposed to just <ADEPTUS ASTARTES> to prevent minor souping like an Ultramarine Gunline with Blood Angel Supreme Command. Ynnari still could remain a problem though as they then become the only faction I think who can skirt around that issue. You should only need the latest CA and Big FAQ (GW have now removed the previous ones from their website). Other FAQs and errata are only an occasional reference for rules clarification aren't they? That's from Big FAQ 1 (no longer available) and repeated in the BRB errata. Fortunately BattleScribe takes care of the points and CP changes. Yes I would l like an updated rules book. See that's confusing. Did they make an official statement about not using the first FAQ any more? I printed mine out and put it in a binder. I guess I should toss the first one now as its invalid? A rule to restrict souping wouldn't change the fact that many armies simply can't stand up to Guard, Ynnari, or Orks. I guess if you accept that marines/CSM are supposed to be bad, or just delete them from the game, this edition is fairly well balanced. No they didn't which was why I was confused too. Anything from a Big FAQ should end up in CA (or the next Big FAQ). In this case you've found a rule change that ended up in the BRB errata. In any case, you don't need that original FAQ anymore. This is a horrible idea. 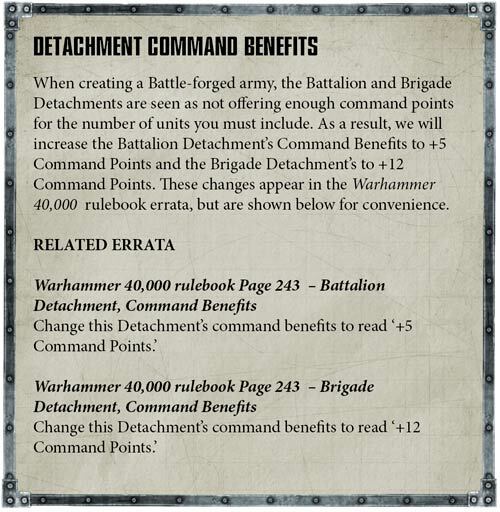 If GW just repackages and incorporates the erratta into the rules, a lot of people won't buy it. It's the dreaded "D&D 3.5" phenomenon all over again. Which is why they need to get away from the idea of selling rulebooks. I've no problem with selling Codexes and CA, but the main rulebook should be free, or at least access to the core rules should be free and digital. Note, that means all the terrain rules (minimal as they are) and the "advanced" rules for detachments and missions that aren't in the Battle Primer. Then all these changes to the core rules can be properly updated in one place. This is how FFG does X-Wing now. The core set contains a basic Getting Started rules leaflet but the full rules are in an online Rules Reference, which allows them to alter core rules as needed. It also means all you need to do to check up on the core rules is check the rules reference, rather than trawl through multiple FAQ and errata documents. I just hope that when v8.1 arrives we don’t get Persistent Psychic Powers and some unnecessary cards. That seems to be current M.O.